Wibu-Systems is proud to be part of an outstanding consortium that will be officially announced at CeBIT 2015. 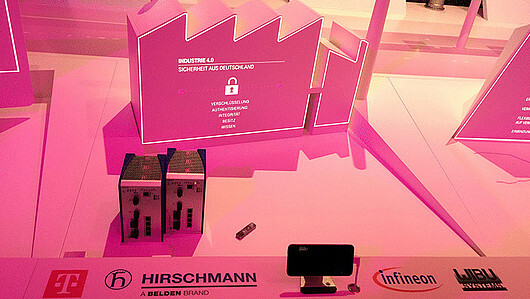 Deutsche Telekom, Infineon Technologies, Wibu-Systems and Hirschmann have joined forces to deliver security Made in Germany to the entire Industry 4.0 arena. The partnership started to take shape already last year at the National IT Summit, where the Digital Agenda for 2014-2017, promoting innovations to support Germany’s growth and employment, the implementation of comprehensive high speed networks and digital media literacy, and the improvement of security and protection of IT systems and services, received significant stimulus. Industry 4.0, that’s to say the interconnectivity of production systems, is shaping how laboratories, factories and warehouses are restructuring their concept designs to increase performance, quality standards, and in turn market positioning. This translates into Big Data being generated and transmitted across wider networks, often involving the Cloud as well. Security is therefore key in the process to make sure Smart Factories can model our future. “Industry 4.0 opens the doors to our factories - with security solutions 'Made in Germany' we protect know-how and machines in an increasingly networked production environment,” states Dr. Reinhard Ploss, CEO at Infineon Technologies. “We are currently working with industry partners on specific solutions that they can already be integrated in Industry 4.0 design concepts. The security issue plays a central role for both our customers and partners,” adds Reinhard Clemens, Member of Deutsche Telekom’s Management Board and CEO of T-Systems. At the Deutsche Telekom exhibit at booth C26, hall 4 you will be able to enjoy a brand new demonstration of a distributed production facility featuring a completely secure network. This solution will be available on the market in the upcoming months as an out-of-the-box technology for the easiest implementation experience ever. In their complementary role, Deutsche Telekom will be in charge of its commercialization, Infineon Technologies will provide their security controllers (smart card based chips and Trusted Platform Modules), Hirschmann will contribute with their routers featuring TPM-based authentication, and Wibu-Systems will be responsible for protecting, securing and authenticating production data with CodeMeter. “We are honored to team with some of the largest industrial players in Germany. Our country has the potential to lead this digital transformation offering technological excellence. In our capacity, Wibu-Systems will grant intellectual property protection of software and products, through integrity protection of the code, and strong authentication of production data,” explains Oliver Winzenried, CEO and founder of Wibu-Systems.